The global financial crisis of 2008 has slowly yielded to a global unemployment crisis. This unemployment crisis will, fairly quickly, give way to a political crisis. The crisis involves all three of the major pillars of the global system -- Europe, China and the United States. The level of intensity differs, the political response differs and the relationship to the financial crisis differs. But there is a common element, which is that unemployment is increasingly replacing finance as the central problem of the financial system. Europe is the focal point of this crisis. Last week Italy held elections, and the party that won the most votes -- with about a quarter of the total -- was a brand-new group called the Five Star Movement that is led by a professional comedian. Two things are of interest about this movement. First, one of its central pillars is the call for defaulting on a part of Italy's debt as the lesser of evils. The second is that Italy, with 11.2 percent unemployment, is far from the worst case of unemployment in the European Union. Nevertheless, Italy is breeding radical parties deeply opposed to the austerity policies currently in place. The core debate in Europe has been how to solve the sovereign debt crisis and the resulting threat to Europe's banks. The issue was who would bear the burden of stabilizing the system. The argument that won the day, particularly among Europe's elites, was that what Europe needed was austerity, that government spending had to be dramatically restrained so that sovereign debt -- however restructured it might be -- would not default. .Consider the geography of unemployment. 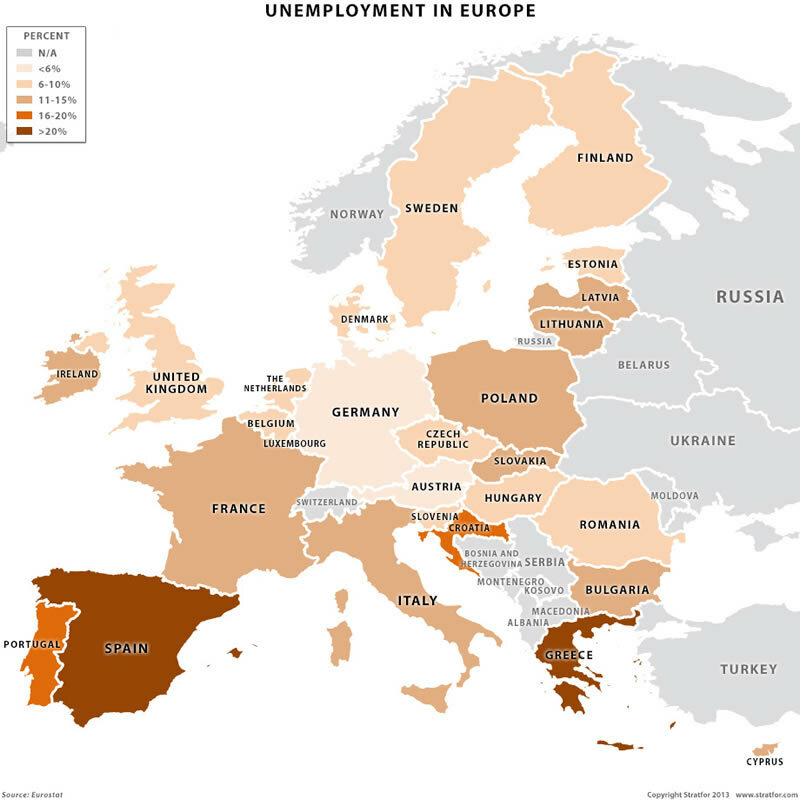 Only four countries in Europe are at or below 6 percent unemployment: the geographically contiguous countries of Germany, Austria, the Netherlands and Luxembourg. The immediate periphery has much higher unemployment; Denmark at 7.4 percent, the United Kingdom at 7.7 percent, France at 10.6 percent and Poland at 10.6 percent. In the far periphery, Italy is at 11.7 percent, Lithuania is at 13.3 percent, Ireland is at 14.7 percent, Portugal is at 17.6 percent, Spain is at 26.2 percent and Greece is at 27 percent. Germany, the world's fourth-largest economy, is at the center of gravity of Europe. Exports of goods and services are the equivalent of 51 percent of Germany's gross domestic product, and more than half of Germany's exports go to other European countries. Germany sees the European Union's free trade zone as essential for its survival. Without free access to these markets, its exports would contract dramatically and unemployment would soar. The euro is a tool that Germany, with its outsized influence, uses to manage its trade relations -- and this management puts other members of the eurozone at a disadvantage. Countries with relatively low wages ought to have a competitive advantage over German exports. However, many have negative balances of trade. Thus, when the financial crisis hit, their ability to manage was insufficient and led to sovereign debt crises, which in turn further undermined their position via austerity, especially as their membership in the eurozone doesn't allow them to apply their own monetary policies. The growing tension between France and Germany is particularly important. Franco-German relations were not only one of the founding principles of the European Union but one of the reasons the union exists. After the two world wars, it was understood that the peace of Europe depended on unity between France and Germany. The relationship is far from shattered, but it is strained. Germany wants to see the European Central Bank continue its policy of focusing on controlling inflation. This is in Germany's interest. France, with close to 11 percent unemployment, needs the European Central Bank to stimulate the European economy in order to reduce unemployment. This is not an arcane debate. It is a debate over who controls the European Central Bank, what the priorities of Europe are and, ultimately, how Europe can exist with such vast differences in unemployment. The crisis of unemployment is a political crisis, and that political crisis will undermine all of the institutions Europe has worked so hard to craft. For 17 years Europe thrived, but that was during one of the most prosperous times in history. It has not encountered one of the nightmares of all countries and an old and deep European nightmare: unemployment on a massive scale. The test of Europe is not sovereign debt. It is whether it can avoid old and bad habits rooted in unemployment. "Europe, Unemployment and Instability is republished with permission of Stratfor."